I think it’s time we say goodbye to emails; probably not today though. WhatsApp rolls out one of the most anticipated feature to its iOS and Android devices; document sharing. The tech company has not made an official announcement about the development, but the feature pops up alongside other sharing options, like photo or video sharing, contact sharing and location sharing. In a chat on Android, you tap the attachment icon then press the new “Document” icon that appears. On iOS, you tap the arrow icon in the chat then pick “Share Document” from the menu that appears. The feature will allow users to send documents from cloud storage services including Google Drive, Dropbox, iCloud Drive, and others. However, the feature is limited to only PDF files for now. The feature is reliable on Android smartphones given the fact that you don’t need to log in your Gmail or Yahoo account to be able to send stuff. Sometimes it takes time to send a document to a friend especially when the internet is low. Thanks to WhatsApp, just app them your notes in seconds. To test its ability, I sent a 163KB Partnerships Act to my friend which was received in a few seconds. To add on that, WhatsApp allows the sender to know the number of pages he or she has sent. For example, I sent a 52 page document to Sally, that information could be seen on my chat. The network’s ability to send documents with that kind of speed, will definitely give Gmail and Yahoo a tight competition because people want to send information on the go. 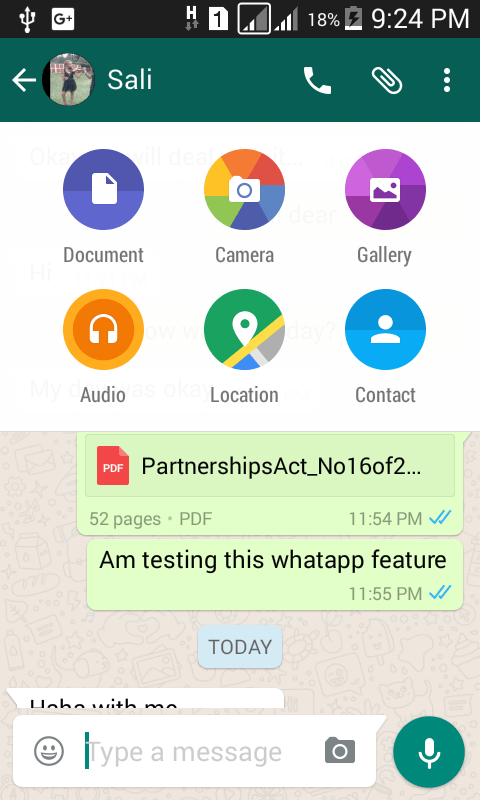 On the flip side, if the recipient hasn’t upgraded to the latest version of WhatsApp, document sharing won’t work. However, the app will tell you that the contact has to update WhatsApp to receive documents. WhatsApp has more than 1billion users and the number grows every day. Even with the limited functionality available at present, document sharing could help to boost business use of WhatsApp’s messenger app, given how prevalent PDFs are in the professional world. Mobile Money Big fish M-Pesa new target in the industry.